Our team at Thompson Suburban can fabricate quality provisional crowns and bridges (and other temporary restorations) to protect the implant and allow for the necessary healing. Whether your patient requires a comfortable and attractive provisional restoration for long-term use or a short-term tooth replacement, we will work with you to choose the right materials for the job. 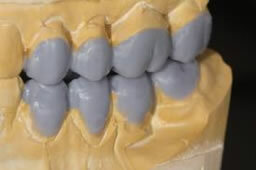 We also offer diagnostic wax-ups that are essentials for the success of most restoration cases. Contact us with any questions about provisional restorations or to discuss your patient’s case.